Oak Creek looks like its old self with crystal clear water that is almost back to normal flows. Along with the beautiful weather and pristine creek conditions came gobs of campers and hikers taking advantage of this beautiful canyon. 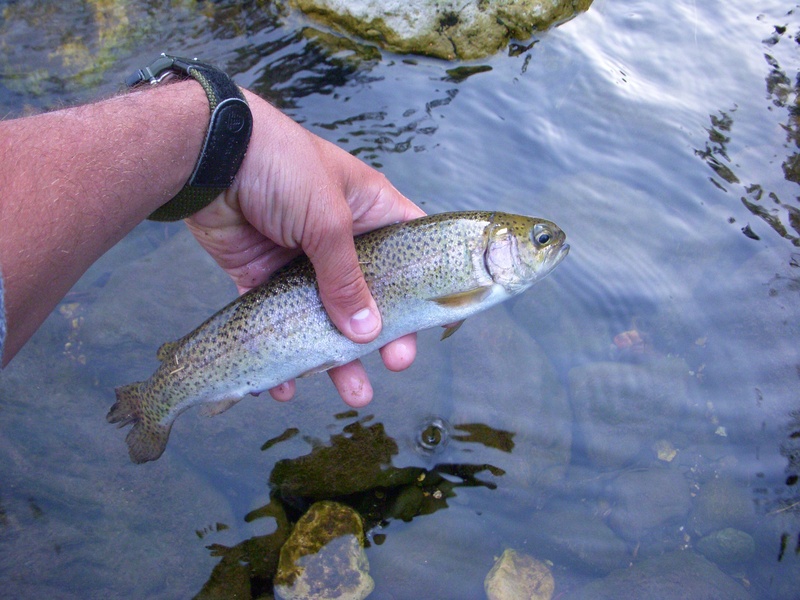 Throughout the day, I landed two fish, one a good size brown and a stocker rainbow. Mid day, I was drifting a heavy nymph through a deep chute when a large brown laid into my stonefly. After about 30 seconds, my 6x tippet snapped leaving me empty handed and more than a little frustrated. In the late afternoon, I moved a little farther north and walked quite a ways, taking the time to fish only the best looking water. Overall a beautiful day on the creek, but probably one of my last for a while. The kicker of the day came as I was fishing my favorite portion of the stream. As I was working a usually productive run, I observed a father, wife, grandmother, and a few kids working their way towards the creek from the opposite side. 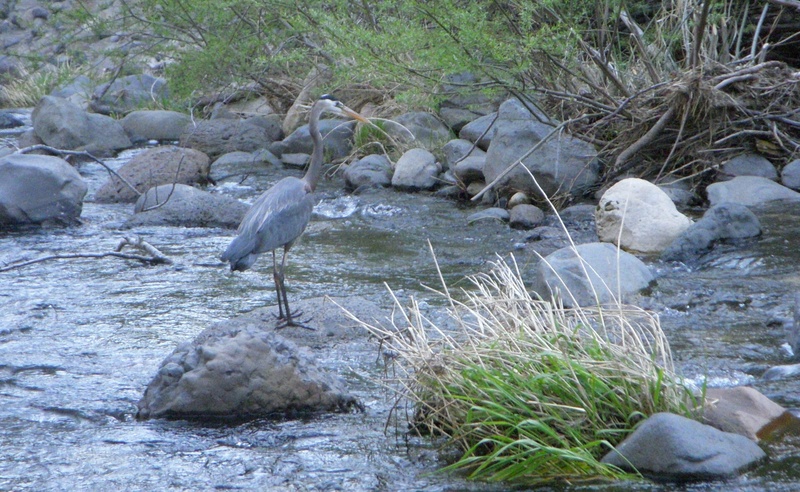 With literally miles of productive water in both directions, they plop down 30 yards away on the opposite bank and begin casting spinning gear into the same pool that I was fishing. Immediately, the fish I was working darted for the depths and the cover of the rocks as lures are landing just a few feet from me. Common sense should dictate that this type of behavior is completely unacceptable and wrong. I probably should have said something, but due to the fact that I was boiling mad and probably would have said something regrettable, I bit my tongue and walked away. The actions and attitude of anglers like this, perpetuate my thoughts of looking for waters that are a little more remote and devoid of a human foot print. 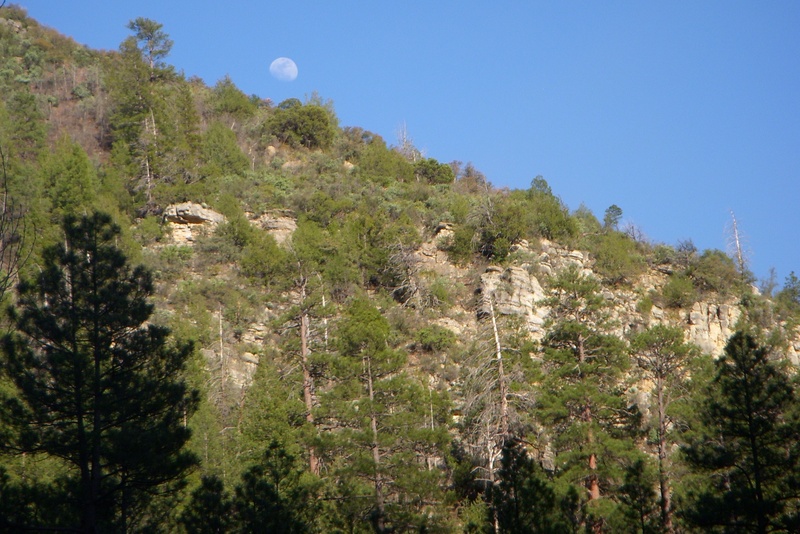 I love Oak Creek and its high canyon walls. It has taught me many things about fly fishing, but the rumble of the passing cars and the kids throwing rocks into the pools that I am fishing can only keep me coming back for so long. Money has been going out much faster than it has been coming in these past few months. So to save some money and wear and tear on my truck, I decided to do some hiking around Lake Pleasant. I was not disappointed. 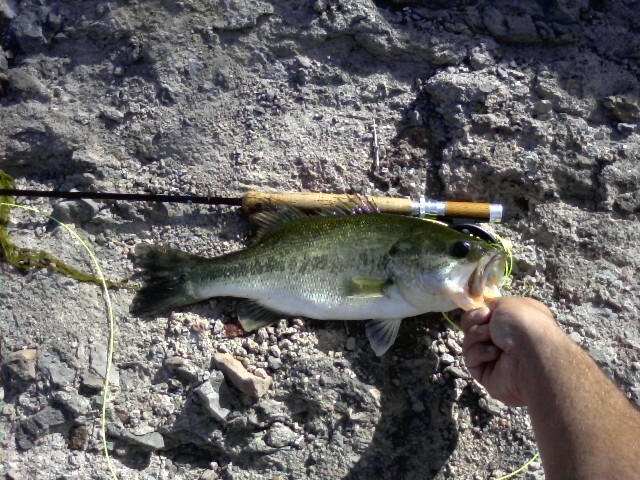 Largemouth bass were still holding close to shore for their spawn or post spawn activities. A weighted brown simi-leech was the soup of the day and my 5 weight was bent to extremes trying to play the bass pictured below to shore. Several other smaller largemouth came out to play, but I called it a day about 11. Good day overall…no snakes. Wedding plans are in the works and I am looking forward to making Michelle my bride on May 29th. Saturday was her bridal shower which left me with day to myself. Leaving at 5, I was on the creek by 7:30 for the start of a slow but satisfying day. 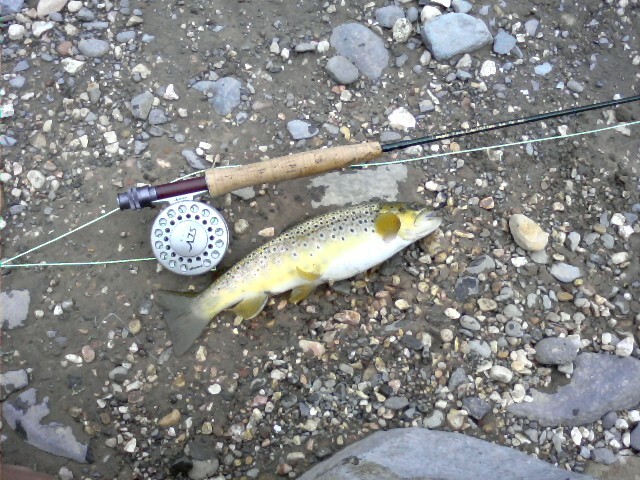 The first pool started off with a bang as a good size brown trout hooked into my simi-leech. As I played the fish closer to shore, I realized that unfortunately my net was safe and secure at home. As I reached for the trout, he gave one last effort and was successful at loosing himself from the fly. I was still in high hopes of a profitable day with a hookup in the first pool, but the day had other plans. The winds picked up making it difficult to make solid casts, and even though the water was relatively clear, the usual lies were under a foot of runoff. The stream was teaming with insect life but I was unable to make any use of it. The second half of the day was spent exploring other portions of the stream which proved to be very profitable. One particular section of the creek was an interesting science lesson. The rocks were covered with casings that were filled with the larva of an insect that I learned latter were caddis flies. I rigged my line with a variety of different nymphs and connected on a fat little brown. The day was beautiful and I saw no other fishermen which can probably be attributed to the high flows. Despite the lack of fishermen, the hiking trails were choked with day-trekkers taking advantage of the pristine weather. 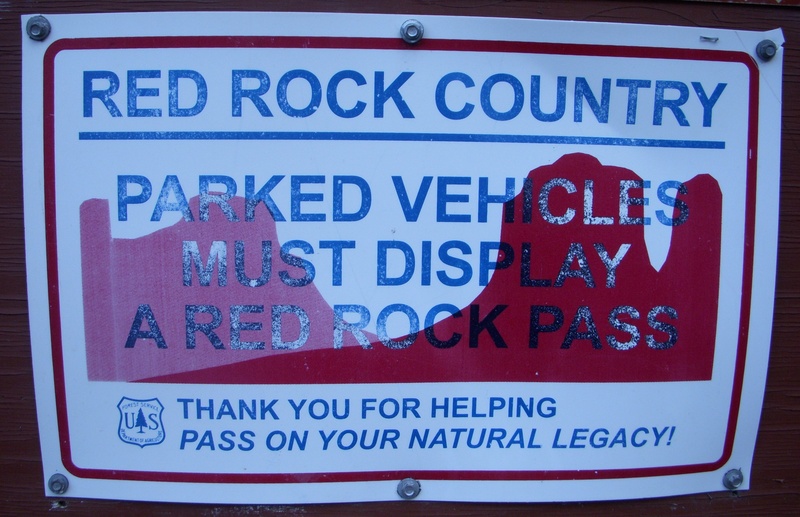 It will not be long until there will not be an empty parking spot the entire length of Oak Creek. Despite my slow day of fishing, the cool weather and warm sun was the perfect way to spend a day off. With only a few hours to fish on this morning, Pete and I opted for the real short drive to Lake Pleasant. I have mixed feelings about this lake due to being skunked several times before, but with a time schedule to keep, options were limited. 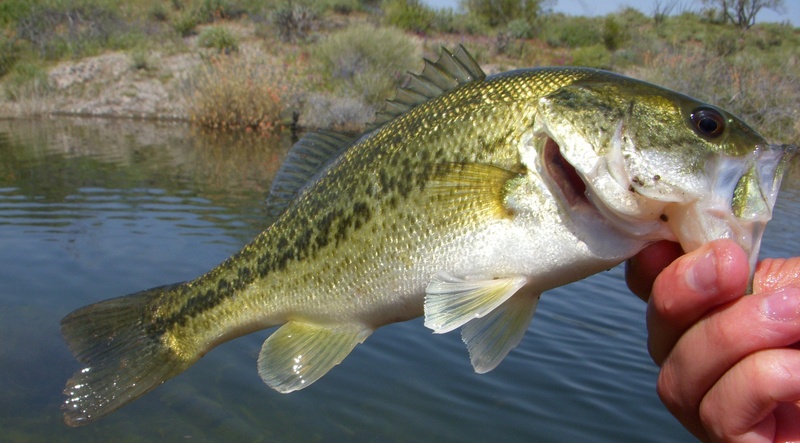 Stories of different species of bass are always being told but usually those with success have some sort of boat to scour fishable areas. On my current income I am confined to the shore and anywhere accessible with a two-wheel drive vehicle. The Arizona sun soon was baking the desert at 85 degrees and we had seen zero action. After walking and fishing multiple coves, I finally happened upon a protected cove where I could see 7-8 different bass holding close to shore. Cycling through my limited fly selection, the black simi leech with an orange glass bead head was the ticket and got movement and looks from multiple fish. Only one of the smaller fish decided to play before we had to call it a day. Wish we could have kept fishing because we finally figured out where to be looking for fish and what they were hungry for. Aside from the one fish and a sunburn, the only other excitement was almost stepping on a rattlesnake. For three years, I have been tramping all over this state and this was the first rattlesnake I have ever seen. It was nice to end the terrible streak of bad luck at Lake Pleasant, but I look forward to getting back on the smaller streams.